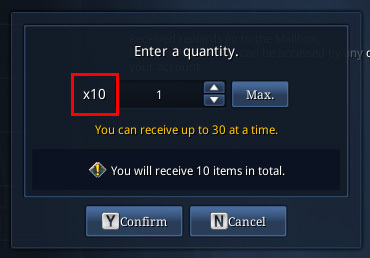 How Do I Claim Items/Purchases in Update 4.3 (Fire and Blood)? There are some new quality-of-life changes to the “Received Items” tab within the new 4.3 Update. First, items will no longer have to be “Unpacked” to claim them. Single items or items that arrive in a single bundle are automatically “Unpacked” (outlined in red). These are denoted with a “(1)” at the end of the entry. Check mark the item(s) that you wish to collect and click on “Retrieve Items” button (outlined in green). Alternatively, you can right-click on the item’s icon, on the right half of the window, without needing to check mark the item or clicking on the "Retrieve Items" button (also outlined in green). 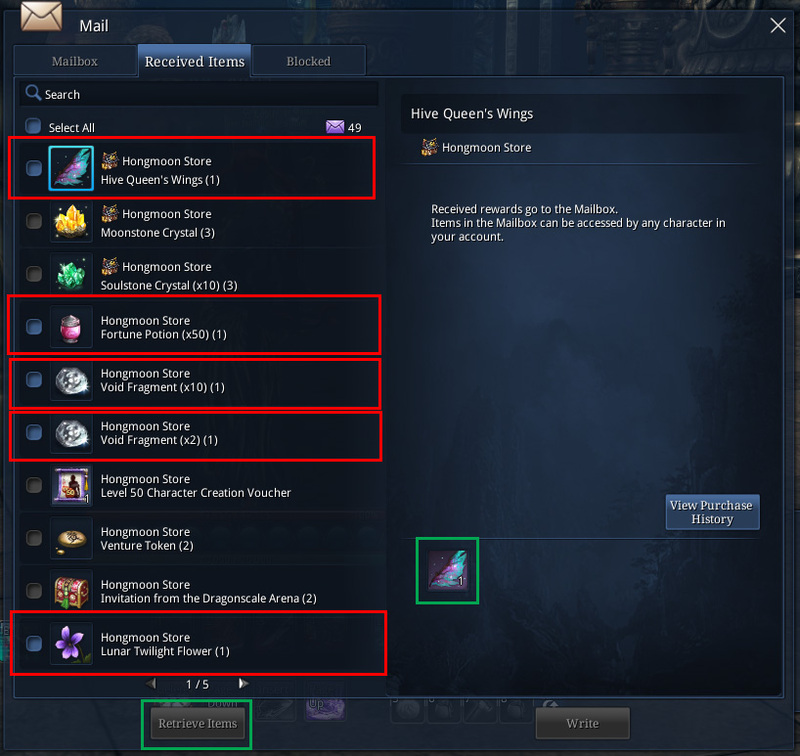 In a similar scenario, items of the same name and stack size will be condensed into one entry within the “Received Items” tab. 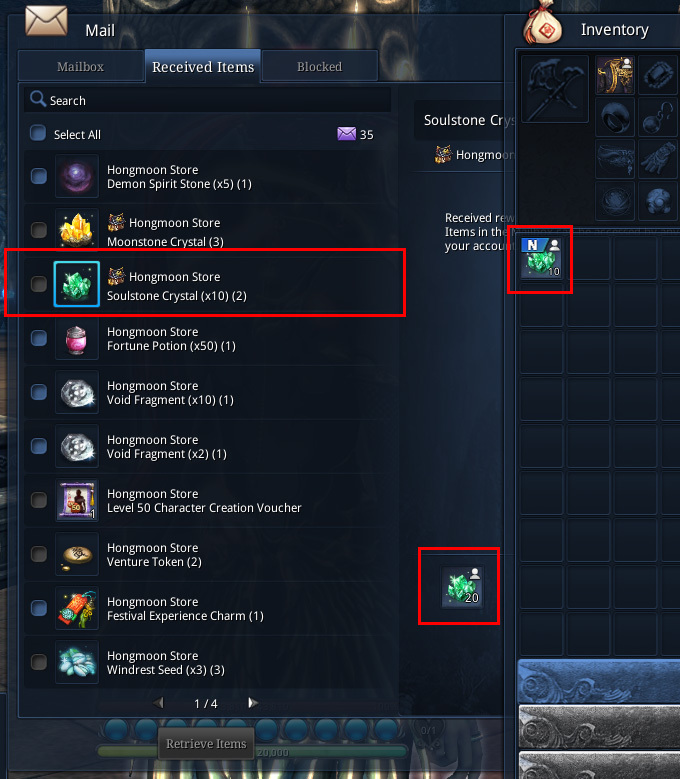 You want to claim one stack of "Soulstone Crystal (x10)" out of the three (3) stacks available (outlined in red). 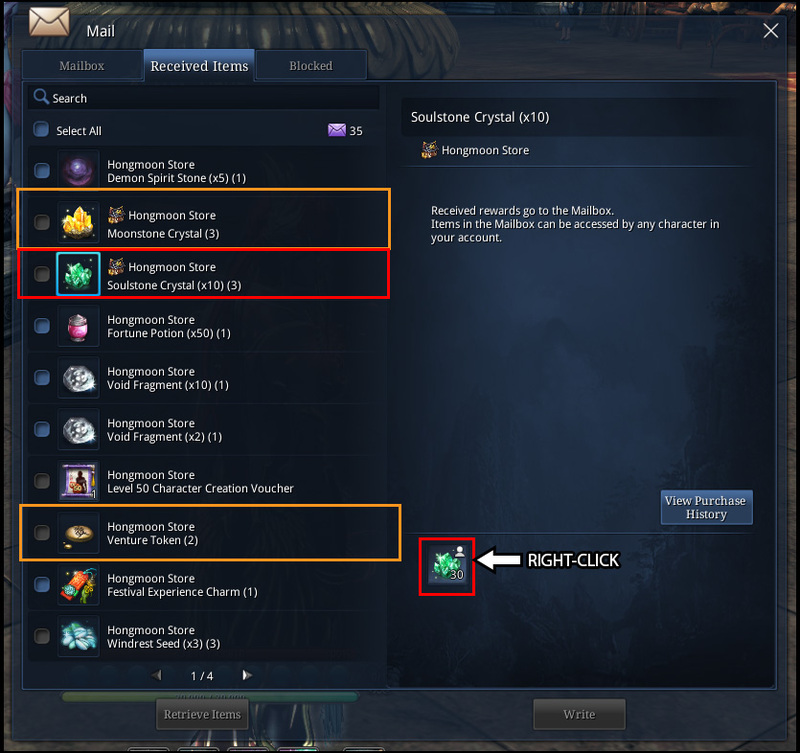 Left-click on the "Soulstone Crystal (x10) (3)" entry. Right-click on the icon on the right-hand side of the window. Choose the amount of stacks I want to claim. In this case, it's 1 stack. The stack sizes for this entry are stacks of 10 Soulstone Crystals. The inventory gained 10 Soulstone Crystals. The "Received Items" tab now shows (2) stacks left of "Soulstone Crystal (x10)". The items outlined in orange would work the same way, except they’re stacks of single (non-bundled) items. These items work a bit differently, in the way of claiming them. In this example, we'll be working with the Duelist Bundle. 1. Make sure that there are NO check marks on the left-hand side of the window. If there are check marks, clicking on any of the Duelist Bundle entries one more time will remove all check marks. 2. Right-click on the item that you want to remove from the bundle, from the right hand side of the window. (Example: Designer Weapon Skin Chest). 3. Verify the extraction in the follow-up confirmation window. 2b. Right-click on any item on the right-hand side of the window. 3. Depending on which method you choose, you'll get a different confirmation window. However, the displayed information is not correct. NOTE: It does not matter if you chose method "2a" or "2b". If the check marks are filled in, the system will pull ALL of the remaining Bundle items out of your Received Items tab and move them into that character's inventory.